This statistic shows the motivation for high-net-worth and ultra-high-net-worth Americans to build wealth, as of 2018. The results are sorted by generation. 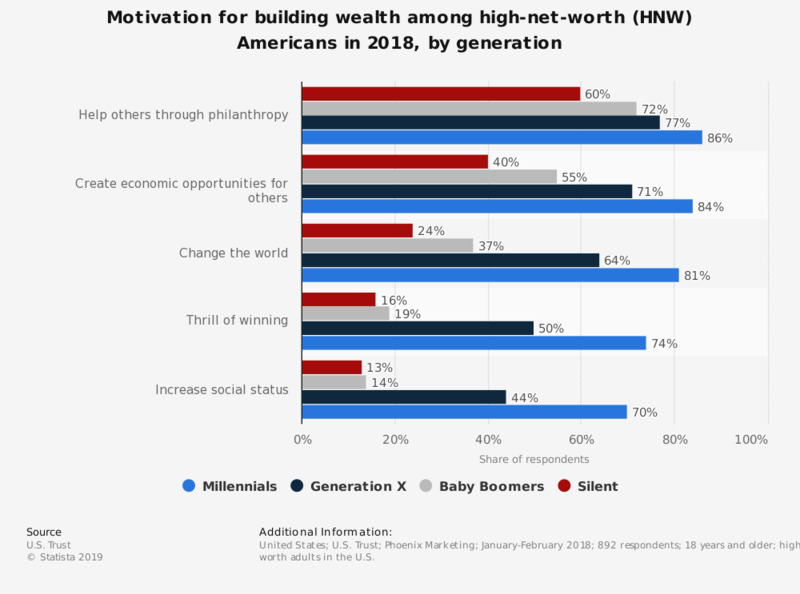 During the survey, 86 percent of wealthy Millennials said their motivation to build wealth was to be able to help others through philanthropy; 77 percent of rich Generation X'ers said the same. high-net-worth and ultra-high-net-worth adults in the U.S. The original question was "When it comes to your motivation for creating wealth, how important are each of the following to you?" Everything On "Millionaires in the United States" in One Document: Edited and Divided into Handy Chapters. Including Detailed References. Statistics on "Millionaires in the United States"
What are your main motivations for running? Which feelings encourage the consumption of chocolate?